I’m so excited that I was able to make some progress on my 2014 UFO list today! This sink area is in our living room next to the fireplace. 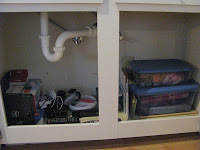 We don’t actually use the sink so I don’t have to worry about water dripping underneath into the storage area. Before, this cupboard was a complete mess. It was basically being used as a catch-all. I still don’t think it’s organized all that well and I would love to buy some more storage bins someday. But at least it’s much tidier now. 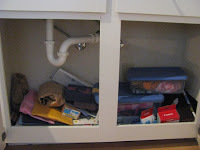 The containers on the right are for my knitting and quilting supplies (minus yarn and fabric). Next to that is my stack of cards and stationary, which is mainly used for our child sponsorship kiddos. Then there is a stack of remotes for the blu-ray player and cable box and Wii. AND there is a stack of office supplies like extra printer cartridges and printer paper. It’s still a catch-all but at least it’s now an organized catch-all. I can’t believe that I was able to throw out half a bag of recyclable papers and half a bag of non-recyclable items. Where does all of the junk come from? I have a hard time fathoming where the clutter originates when we moved to Washington with our belongings backed into 14-ish boxes of books and the contents of our car. It’s amazing how much you can accumulate in a year and a half without even trying. It feels good to be making some progress! Now what should I tackle next…? I think the stuff is breeding in dark places. I love stacking bins …teouble is, just about the time you need more, they go and change the style and size. I love the changes here.